It’s been three weeks since we celebrated the New Year. We joined our friends where the tradition is to write resolutions on a piece of paper, tie it to the end of a balloon string, and release the balloons at midnight. My girls (5 and 8) made it until midnight and was excited to let go of their balloons! This year instead of resolutions, I wanted to focus more on an overall intention. After much contemplation, GROWTH was the one word that really spoke to me. Disclosure: This post contains Amazon affiliate links. It means a small percentage of your purchase will go towards my affiliate account. Further info on affiliations is available here. Thanks for your support. A couple of years ago, I experienced a renewal of faith. Growing up in the Philippines, my family had strong religious roots in the Catholic church. As a young girl, my belief in God was strong. I remember writing letters to God and storing it in my clothes drawer. As I grew up, my faith dissipated. Instead of listening in church, I found myself daydreaming. I felt that I wasn’t as close to God as I used to be. Uninspired, I stopped going to church, yet still spoke to God in my prayers. It was my daughter’s curiosity about God that drew me back to church. She asked if she could go to an after-school Bible study program offered at her school. It was a blessing itself that her public elementary school allowed a Bible study program for children. The group of wonderful volunteers who organized this program were members of a community church near where we lived. My faith blossomed when my family started attending services in this church. Every Sunday as I listened to the pastor’s words, my love for God multiplied and sparked a desire in me to serve others in His name. 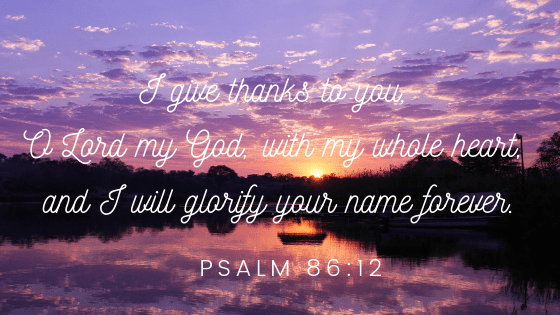 This year I want to continue to grow – to glorify God and enjoy his presence. To thrive, I have to understand my emotions – why I feel the way I do. It is when we understand our emotions that we can identify if the needs in our life are or aren’t being fulfilled. 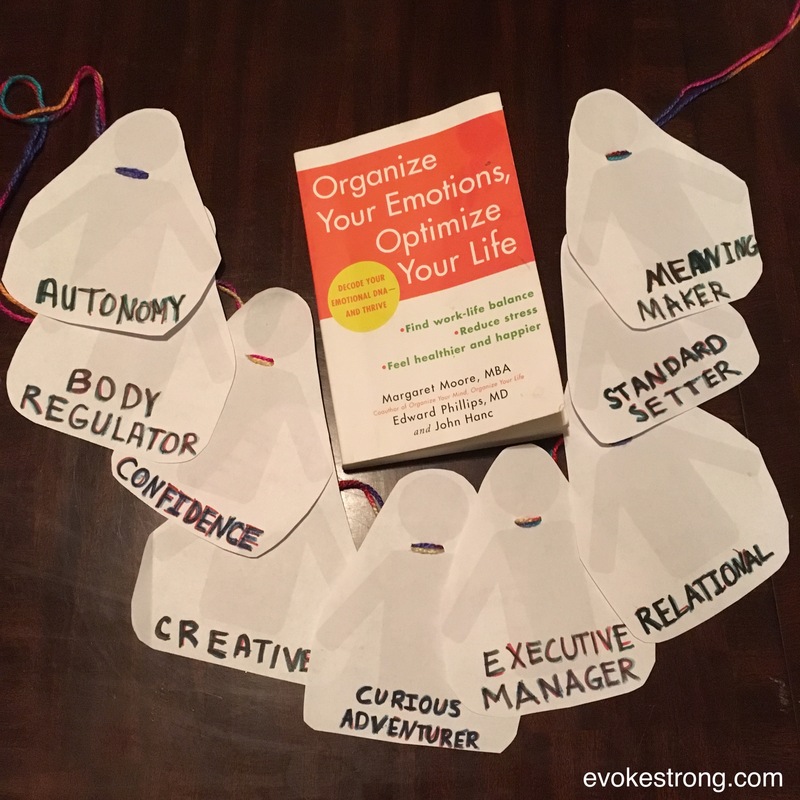 Coincidentally, the required reading for my graduate winter course focused on this very topic, titled Organize your Emotions, Optimize your Life by Margaret Moore (CEO of Wellcoaches), Edward Phillips, MD, and John Hanc. I created these paper cut-outs with the help of my kids when I was the Table-Topics Master for my Toastmasters club. The theme for the night was Self-Awareness. As explained in the book, our emotions are driven by certain needs. AUTONOMY, BODY REGULATOR, CONFIDENCE, CREATIVE, CURIOUS ADVENTURER, EXECUTIVE MANAGER, RELATIONAL, STANDARD SETTER, AND MEANING MAKER. If you’d like to learn more about these personalities, pick up a copy of the book or read a summary on this article written by Margaret Moore. I did an assignment in class to determine which of these personalities spoke the loudest – they were the Body Regulator, Executive Manager, Relational, Meaning Maker and Standard Setter. When an outside force mute these dominant voices, I start to feel negative emotions. Ideally, we should listen to each aspect of the Inner Family. A thriving well-being is dependent on satisfying all of these sub-personalities. This spring marks my final semester of graduate school. 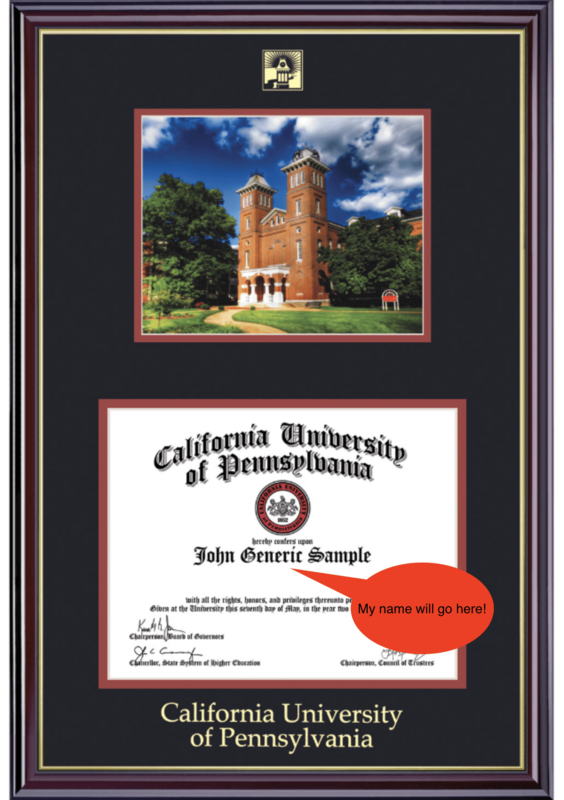 In December 2017, I enrolled in an online graduate program at California University of PA using the GI Bill I earned from serving in the Navy for 11 years. What enticed me in this program was its partnership with Wellcoaches offering a concentration in Wellness Coaching with an M.S. degree in Exercise Science and Health Promotions. Ever since I decided to make a lifestyle change to lower my risk for Type 2 diabetes, I became interested in the psychology behind behavior change. As I learned in a previous class, change begins in our minds. With graduation and certification on the horizon, I have to focus on the business aspects of starting my own practice. It’s something I’ve already started working on since last year but haven’t exactly figured out the finer details of it. After I graduate, I will shift all my energy in growing this coaching practice. I feel confident in saying, this has been the missing link for those who are struggling with making lifestyle changes. I look forward to my growth this year and come December 31st, I will reflect on the extent of which I’ve grown. Do you have a One-Word Intention for 2019? Have you paid attention to which of your sub-personalities’ voice speaks to you the loudest? Best advice for an entrepreneur in the Wellness space? Previous postAre you READY, WILLING, and ABLE? I think that growth, in all fields, is such a great intention for 2019. I always believe that without growth there can’t be change, and change is good! Growth is a great word. Everyone should always be growing no matter how old you are. Growth is a great intention for the New Year! My intention for the year is to be Mindful. Thanks Marcia. Mindfulness was my intention for last year and it’s a practice that I need to work on consistently. Gratitude is so important. I spend my morning and nights writing down three things I’m grateful for. It puts everything into perspective. I don’t really have an intention or word, I’m just trying to stay more positive and hopeful this year. There are a lot of things that we’ve been saying “someday” to as a family and I don’t want to say someday anymore. So I’m trying to be brave and push myself/take new avenues with different parts in my life in order to hopefully turn some of those somedays into todays. Sounds like you have set the intention to have the courage to try new experiences. I hope your somedays will happen this year! FANTASTIC! I encourage you to continue surrounding yourself with other successful coaches and entrepreneurs. You have so much to offer and will do so well in your practice. Mona, thank you for the encouraging words. I really appreciate it and pushes me forward.